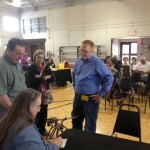 Great turn out this morning at the Annual Mebane Historical Museum’s Appraisal Fair. There was at least 25 people waiting in line at Jon’s booth from start to finish. Like and Follow Us On..
Coca-Cola Sign Discovery Hanging on Front Porch for 35 Years! Wi-Fi Access is available to bidders.